In Russia, the February Revolution of 1917 ended a dynasty with a 300-year-old tradition. Nicholas II, Tsar of Russia since 1894, was forced to abdicate after the outbreak of popular uprisings in Petrograd. Crowned in 1894, Nicholas proved to be an inefficient and relatively weak leader, totally incompatible with the role of authority he held in the state. At the turn of the nineteenth and twentieth centuries, the Russian people were yearning for change, social disturbances were proliferating and the autocratic regime was not willing to accept the concessions that were desired by the population. In addition, in the early years of the twentieth century, the disastrous losses of the Russo-Japanese war, which no one had expected, exacerbated social grievances and tensions, leading to the 1905 Revolution. Spirits calmed down only after the Tsar promised significant reforms, notably the establishment of a representative government. The desired changes did not take place, for the Tsar dissolved the Duma immediately when it opposed him. At the same time, radical leftist groups- especially the Bolsheviks- were gaining more and more land. In 1914, Russia entered another war- bigger than the previous one ten years ago, and the problems caused by the conflict (famines, military losses) once more proved that the Tsar was not a true leader. When the initial enthusiasm of 1914 waned after the first year of war, Nicholas made the decision to take over the command of the Russian army himself, with the subsequent military failures being directly associated with him. A few months after the October Revolution of 1917, Russia signed a peace treaty with the Central Powers taking it out of the First World War. But for the Russians the war did not end: a very long and violent civil war would soon begin. In 1913, Tsar Nicholas II celebrated 300 years since the Romanov dynasty came to Russia. Since the crowning of Michael Romanov in 1613, the dynasty managed to create a vast empire stretching from Central Europe to the Pacific, from the Arctic Ocean to Afghanistan. This huge empire covered a sixth of the world’s surface and had a population of 150 million people (with over 100 different nationalities). Russia was practically a universe in itself, but one that was at the edge of the abyss due to internal and external tensions. Five years after the 1913 anniversary, the imperial family would be killed, and the empire of the Romanov’s, defeated in war, would fall into the hands of the Bolsheviks. With the Tsar always on the front, his wife, Alexandra, was more involved in governmental affairs. Once the problems started (inflation, food shortages, an increasingly impoverished population), people began to associate the Tsarina of German origin with all these shortcomings, all the more so since its close relationship with Rasputin, her counsellor, was not seen in a good light. 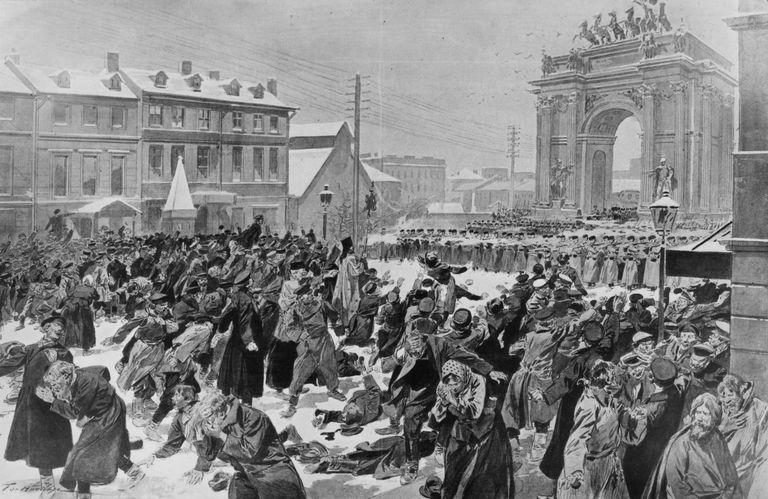 In March 1917 (February, after the Julian calendar), massive strikes and demonstrations against the leadership began in the capital of Petrograd. The striking workers were supported by the Petrograd garrison, and after a week of great social tension, the Tsar was forced to abdicate. Theoretically, he abdicated in his name and on behalf of direct successor, the little Tsarevich, leaving the throne to his brother, the Grand Duke Michael Alexandrovich. But he refused to accept the crown and he too abdicated, thus putting an end to the Romanov dynasty. Immediately thereafter, a provisional government was formed, including liberal and moderate socialists who promised to lead the war effort in a more effective manner. But the real power in the state was held by the socialist leaders of the Petrograd Soviet. At first, Nicholas II and his family were held prisoners in the Tsarskoe Selo Palace, then in Yekaterinburg. In July 1918, in the context of ever-increasing pressure from counter-revolutionary forces during the Civil War, the Bolsheviks took the decision to eliminate the Tsar. He and his entire family were murdered on July 17.